The Coalition government has finally acted to correct a huge disparity in the ISA market of savers being forced to split their annual ISA allowances between Cash and Shares ISA's by allowing savers now to use the whole of their annual allowance towards a cash ISA rather than the existing 50/50 split between cash and shares, as investing in shares has never been suitable for the vast majority of savers given that they are a high risk asset class that certainly never deserved a 50/50 portfolio allocation. Even for highly experienced stocks investors such as myself tend to experience sleepless nights when portfolio allocations approach 30% of assets let alone 50%. Therefore for most investors the stock market and floating bonds should never really go above an approx 15% allocation (including pension funds) with the bulk of the rest made up by property and cash (including fixed bonds). The further icing on the cake for savers is the boost in the cash ISA allowance to £15,000, which compares against the current cash ISA allowance of just £5,760, and total ISA allowance of £11,520 for 2013-14. Furthermore now savers can switch between shares and cash ISA's when in the past the switch was only one way from cash to shares. The ISA 'improvements' are especially good news for those like myself who see the Cash ISA's in terms of being a very flexible pensions savings that is immune to the pensions industry vultures and their myriad of scams to steal ones pension fund that results in many disappointed retirees who receive a pittance of what they thought they would receive on retirement, at least cash ISA's have always been transparent. Off course whilst cash ISA's may be bee deemed to be risk free, there is however the risk of a government Cyprus style theft, so whilst Cash ISA's are safe they are not entirely risk free. The new ISA allowance and rules will be active from July 2014. 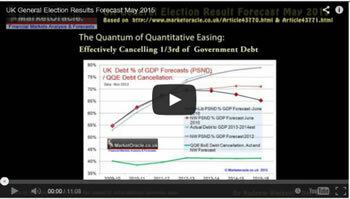 So whilst Britians' savers continue to face what amounts to a zero interest rate catastrophe as the Bank of England continues to get away with government debt monetization and support of the bankrupt banks (Co-op the current bank teetering on the brink of collapse) via unlimited funding scheme that is now approaching its 2nd full year of the collapse in savings interest rates that began in May 2012 and soon accelerated into sub inflation rates of systemic theft as illustrated by the table below which shows the cash ISA rates offered by apparently the often reported as best buy accounts of the Halifax mega-bank that in reality crashed in response to the Bank of England's Funding for Lending Scheme that started in July 2012, still a cash ISA does allow savers to avoid the double taxation theft i.e. savers are taxed on their earnings and then AGAIN on their interest earned on savings. The table illustrates that despite a minor up tick in rates, the tax payer bailed out Halifax continues to across the board pay abysmally poor rates of interest that are far below the official UK RPI Inflation rate of 2.8%. Before you retch at the thoughts of being forced to lock away your hard earned savings for 5 years just to have a chance of beating official inflation. You need to consider the following points of the Newcastle ISA Account that literally get the heart racing for savings obsessive's such as myself. Five year fixed rate of 2.9% per annum. Withdrawals including transfers out are permitted subject to 120 days loss of interest ONLY on the monies withdrawn. Allows deposits and transfers in as long as the issue remains current (open). The key point is that the account allows withdrawals with the loss of 120 days interest, which changes the nature of the account as it is no longer behaves as a 5 year fixed rate account but instead a very high rate of interest paying instant access account that pays 2.9% with a withdrawal fee of 0.98%, that allows for capital to be transferred out at any point during the next 5 years when interest rates rise! Therefore the Newcastle Cash ISA both pays a higher rate of interest (after the early exit charge) AND allows transfers out when interest rate actually do rise. In my opinion this is by far the BEST cash ISA account to appear on the market for at least 18 months due to its flexible nature. Therefore I would not be surprised if high demand results in it soon disappearing from the market place which means it is better to act sooner rather than later. The Allowance for 2013-14 is £11,520, £5,760 for cash and £5,760 for shares ISA's or the whole £11,520 into a shares ISA. Once you withdraw from a Cash ISA you cannot then then re-deposit into. The £5,760 limit refers to total deposited, and not maximum account balance. So if you deposit £5,760, and withdraw £1000, then you cannot re-deposit that £1000 in the same tax year as you have used up your £5,760 deposit limit. The Financial Services Compensation Scheme (FSCS) guarantees the first £85,000 (Euro 100,000) per person, per banking licence . Those with sizable savings that total more than £85,000 should ensure that their institutions really are separate, especially given the banking crisis forced mergers. Next years Cash ISA allowance (2014-15) as mentioned earlier from July 2014 will be boosted to a massive £15,000, which compares to what it was scheduled to rise to inline with CPI inflation of £5,940. Additionally shares ISA's will be able to be converted into Cash ISA's. 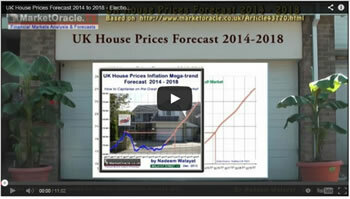 The UK housing market ebook is due be completed by the end of this month (March 2014) that contains extensive analysis and detailed trend forecasts. The ebook also includes extensive guides on how to buy or sell properties, value increasing home improvements, how to maintain and save money on running costs and more - ALL for FREE. Ensure you are subscribed to my always free newsletter for my latest analysis and to be able to download the ebook for FREE on release. Nadeem Walayat has over 25 years experience of trading derivatives, portfolio management and analysing the financial markets, including one of few who both anticipated and Beat the 1987 Crash. 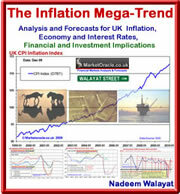 Nadeem's forward looking analysis focuses on UK inflation, economy, stocks, housing market and interest rates. He is the author of five ebook's in the The Inflation Mega-Trend and Stocks Stealth Bull Market series that can be downloaded for Free.